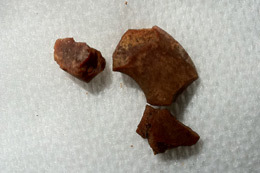 On July 17th 2012 the first amber find found at the Kierikki Stone Age Centre since 2007 was found by 11 year old Hedvig Hautala during the public excavations held at the centre in Oulu region Finland. Hedvig was visiting the Kierikki Stone Age Centre with her brother and godparents when she uncovered pieces of an amber disc pendant. Amber, fossilized resin, was a valued material during the Stone Age used for decorative purposes from jewellery to buttons. From its Baltic source it was traded extensively throughout Northern Europe and its findings at Kierikki indicates trade networks. The oldest pieces of amber jewellery in Finland date to 5500 years ago and include tubular beads and disc pendants such as the one found by Hedvig Hautala. The Kierikki Stone Age Centre, a partner in OpenArch, an award winning museum where the Stone Age comes to life through the reconstructed Stone Age village, exhibitions and public excavations, is a valuable resource in educating visitors about the past. The centre operates in conjunction with the OpenArch scheme with the support of the Culture Program of the European Union. A group of 6 archaeology students from Aberdeen, Cambridge, Nottingham, Reading and Sheffield Universities are excavating 6 weeks the Kierikki site as part of the GRAMPUS Scheme. Currently they are sieving to find more fragments of the amber disc. James Higgin, Mae Jenner, Tomas Joseph, Chloë Percival, Victoria Reid and Elowyn Stevenson all hope to be able to reconstruct a pot from ceramic fragment finds as well as complete the amber disc pendant.